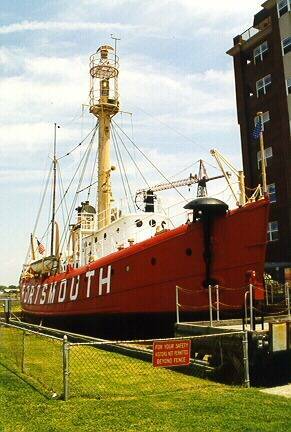 Lightship #101 was built in 1915 and was first stationed off Cape Charles, VA at the CHARLES light station. She served there until 1924, when she was moved to the OVERFALLS lightstation off the Delaware Bay. She served at that station from 1925 until 1951, when she was moved to several stations in New England until her retirement in 1964. She was later moved to Portsmouth, VA, and made into a landlocked museum. She was renamed the PORTSMOUTH as is the custom to take on the name of the station where "standing duty", even though there has never been an actual PORTSMOUTH aids to navigation lightstation. The lightship is located in the heart of the Portsmouth waterfront and is open Tues-Sat from 10AM - 5 PM, Sundays from 1 PM to 5 PM, and is closed on Mondays (Off Season). After Memorial Day they will be open 7 days a week. Their phone number is (757) 393-8591. Take 17 into Portsmouth. This will become High Street, which is the main street of Portsmouth. Continue until it dead-ends in a "T" junction at the waterfront. Turn Left at the "T" onto Water Street. The lightship "Portsmouth" is next to the Radisson hotel. The Naval Shipyard Museum is about a block from the lightship. Maps will be added soon.